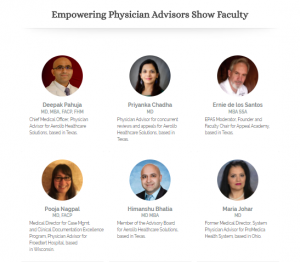 Our goal is to empower Physician Advisors and those who work with them to support provider facilities with the best ability to meet billing & revenue compliance, by providing the best possible environment for appropriate revenue integrity. We choose to do this by discussing and presenting known solutions and possible methods to make clinical records and documentation survive payor audits of all kinds. by physician advisors, for physician advisors. See what shows are in our archives – VISIT THIS PAGE.